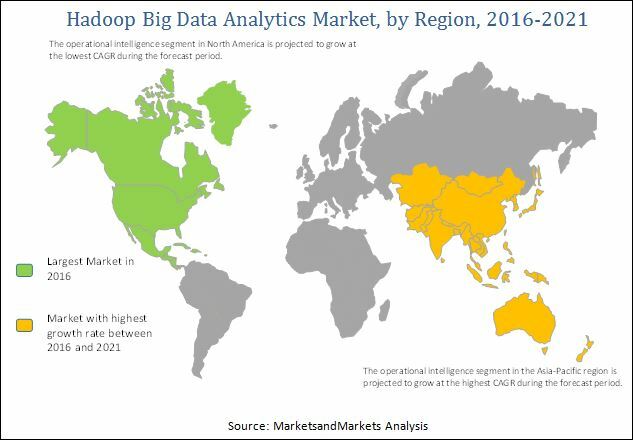 [150 Pages Report] The Hadoop big data analytics market is projected to grow from USD 6.71 Billion in 2016 to USD 40.69 Billion by 2021, at a CAGR of 43.4% between 2016 and 2021. The objective of the research study is to provide detailed segmentation of the market on the basis of component, application, vertical, and region. It also aims to provide information regarding key factors influencing market growth, and strategically analyze subsegments with respect to individual growth trends, future prospects, and contribution to the total market. The report helps analyze opportunities in the Hadoop big data analytics market for stakeholders, provide strategic profiles of key market players to comprehensively analyze core competencies, and draw a competitive landscape of the market. The base year considered for the study is 2015 and the forecast period is from 2016 to 2021. The research methodology used to estimate and forecast the market begins with obtaining data on key vendor revenues and the market size of individual segments through secondary sources, such as annual reports, press releases, investors’ presentations, white papers, and paid databases, which include Factiva and Bloomberg, among others. Vendor offerings are also taken into consideration to determine market segmentation. The bottom-up procedure was employed to arrive at the overall size of Hadoop big data analytics from the revenue of key players (companies) present in the market. The ecosystem of the market comprises Hadoop big data solutions & service providers as well as system integrators. Key players of the market include Microsoft Corporation (U.S.), Amazon Web Services (U.S.), IBM Corporation (U.S.), Teradata Corporation (U.S.), Tableau Software, Inc. (U.S.), Cloudera Inc. (U.S.), Pentaho Corporation (U.S.), MarkLogic Corporation (U.S.), SAP SE (Germany), and Pivotal Software, Inc. (U.S.), among others. The Hadoop big data analytics market is projected to grow from USD 6.71 Billion in 2016 to USD 40.69 Billion by 2021, at a CAGR of 43.4% during the forecast period. Growth in this market is mainly attributed to the increasing volume of big data and growing need for big data analytics. With increase in the volume of big data, companies are looking for ways to analyze and process it quickly and economically. Considering the present state of big data, tremendous amount of information is generated every day in the form of heterogeneous databases. Due to this, the demand for cost-effective Hadoop big data solutions is increasing among enterprises worldwide, as these solutions help manage and analyze such huge data sets. Based on component, the Hadoop big data analytics market has been segmented into solution and service. The solution segment is projected to lead the market during the forecast period, owing to the rising demand for handing huge data sets on distributed computing environments with the help of highly scalable and cost-effective solutions provided by Hadoop. Furthermore, the service segment of the market is anticipated to grow at the highest CAGR from 2016 to 2021. High growth of the service segment can be attributed to the increased use of services by various enterprises to maximize efficiency of their Hadoop big data analytics platforms. Based on application, the risk & fraud analytics segment is anticipated to lead the market during the forecast period. Growth of the risk & fraud analytics application segment can be attributed to the increased adoption of Hadoop big data analytics across varied industry verticals to prevent any potential security attacks and frauds. The security intelligence application segment of this market is projected to grow at the highest CAGR during the forecast period, owing to the rising need to increase visibility and protection of critical resources through advanced analytics. Based on vertical, the transportation & SCM segment of the Hadoop big data analytics market is projected to grow at the highest CAGR during the forecast period, due to the increasing need to integrate transportation & SCM sector with social media platforms and internet traffic to forecast production of various end products and take further decisions related to product pricing and promotions. The BFSI segment of the Hadoop big data market is expected to lead the market from 2016 to 2021. Growth of the BFSI segment can be attributed to the data-driven nature of BFSI industry, which is utilizing the power of big data analytics to understand its customers and update its services to meet their requirements. Among all regions, North America accounted for the largest share of the market in 2015. The market in Asia-Pacific is projected to grow at the highest CAGR during the forecast period. This growth can be attributed to the increasing deployment of Hadoop big data solutions by enterprises in the Asia-Pacific region to enhance efficiency and streamline their business operations. Vendors also face problems with respect to immature technology framework for Hadoop, which acts as a key restraint to the growth of the market. In addition, security issues related to Hadoop big data platforms serve to be a key challenge to the growth of the Hadoop big data analytics market. Key players in this market such as Microsoft Corporation (U.S.), Amazon Web Services (U.S.), IBM Corporation (U.S.), Teradata Corporation (U.S.), Tableau Software, Inc. (U.S.), and Cloudera, Inc. (U.S.) have adopted agreements, collaborations, and partnerships as key strategies to enhance their client base and customer experience. Existing players such as Pentaho Corporation (U.S.), Microsoft Corporation (U.S.), Amazon Web Services (U.S.), IBM Corporation (U.S.), Teradata Corporation (U.S.), and Tableau Software, Inc. (U.S.) are constantly innovating and upgrading their products to enhance market share. Furthermore, owing to technological advancements in the field of Hadoop big data analytics, key vendors are focused on launching next-generation solutions and services aimed at enhancing analytics of real-time data and improving Hadoop security integrations.